Lost foam casting is another investment casting method that differs from lost wax casting. The Lost Foam casting process was first started in year 1958 when H.F. Shroyer was granted a patent for a cavity-less casting method, using a polystyrene foam pattern embedded in traditional green sand. The polystyrene foam pattern left in the sand is decomposed by the poured molten metal. The metal replaces the foam pattern, exactly duplicating all of the features of the original pattern. Like water glass investment casting method, a pattern is required for pouring in casting, because it is evaporated (“lost”) in the process. Tooling: Typically, tooling is composed of a split-cavity machined aluminum die that is the negative mold from which the foam pattern is produced. The tooling is highly specialized and must be constructed by experienced tooling manufacturers familiar with the requirements of the foam molders and foundries. Most tooling for Lost Foam patterns will compare favorably with permanent and die cast tooling. As a result of the materials used and the process stresses, Lost Foam tools can be expected to have 3 to 4 times the cycle life of permanent mold or die casting tools. Pattern Making: The first step is producing a foam pattern and gating system by foam molding press. The process of pattern making can vary depending on the number of items that will be replicated. In most cases, the pattern is molded in polystyrene (2.5% polystyrene and 97.5% air) in a closed mold. The pattern can be molded with either the risers and gates already in place, or it can be assembled (usually glued) from various molded parts. In the pattern making process, very detailed attention is needed as it will determine the quality and reliability of the final product. Techniques for making patterns include: Closed die molding, assembly of the pattern from various parts and machining the pattern from a solid piece of polystyrene. Coating: The gating systems and pattern (either one molded piece or assembled from various parts) are glued together to make what is called the cluster. This cluster is now coated with a permeable refractory coating and left to dry under very controlled conditions. A hard shell and supportive outer mass is formed around the pattern. This ‘coating’ is very much like the one seen in lost wax casting and manufacturers will make use of various ‘coating’ materials, depending on the requirements of the final product and, more particularly, the desired finish. Sand: This dried and coated cluster is now invested in a foundry flask with loose, unbounded sand which is vibrated in order to provide a tight compaction, leaving behind the pattern/shape in the sand. Pouring: Now the molten metal is poured on to the top of the gating system, which is responsible for directing the molten metal through the cluster. The molten metal being poured causes the the pattern made in the first step to immediately vaporize. Pouring will continue until the mold is filled and, in cases where the use of risers are not applied, extreme care is taken to ensure that the correct amount of molten material is poured. Solidification: Once the mold has been filled, it is left in order for the molten material to solidify. Once solidification has taken place, the sand and shell mold is broken, and risers and gates are removed, leaving behind the final casting/product. Post Treatment: The final product can then also be heat treated or undergo other finishing operations much like what is seen in other casting processes. The lost foam casting process enables foundries to produce complex castings – casting that would normally require cores. Furthermore, this metal casting process is capable of delivering dimensionally accurate castings with an excellent as-cast surface finish. No draft is required in this process, meaning that the mold has no split lines, leading to the absence of the forming of flash and the reduction or elimination of further finishing processes. This reduction in post-casting processes reduces the amount of material wasted during the process as well as a reduction in production cost per unit. Because lost foam casting is such a ‘simplistic’ process, it is a much more affordable process (within the right production circumstances). When compared to lost wax investment casting, this process has fewer manufacturing steps, risers are usually not required, foam is more inexpensive than wax, and, within the right boundaries, it can be a more economically viable casting process. The foam used in the casting process is easy to manipulate, glue and carve – this allows freedom and flexibility in design. Another advantage offered by foam casting is the fact that it allows the consolidation of parts, in many cases where other casting processes would have required the production of one or more parts followed by down-the-line assembly. Of course, when it comes to lost foam casting, there also exsits some disadvantages. One is the cost of pattern. If the production volume, the cost of pattern is relatively high and due to the low strength, the foam pattern could be damaged easily. Besides, the mold cost of lost foam casting is also a bit higher than that of water glass casting. Theoretically, all the all ferrous and non-ferrous materials are suitable for lost foam casting process. 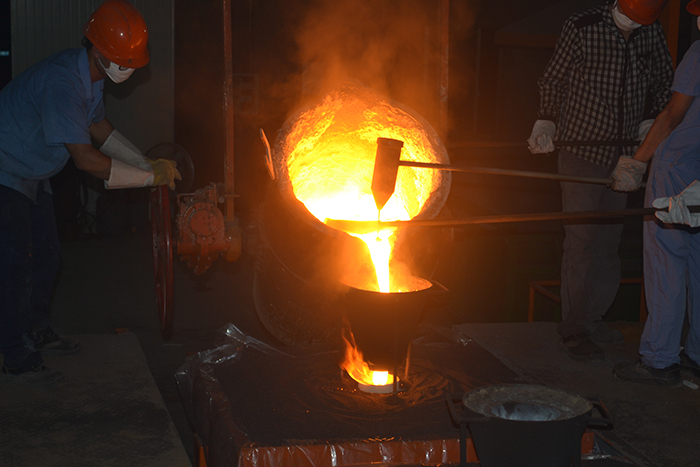 In our foundry, we could use this casting method for most steel castings and iron castings(ductile iron,gray iron, high chrome iron). As the professional investment casting foundry in China, our lost foam casting method is able to make products range from 0.5kgs to 50kgs.Such lost foam casting are mainly used in the field of agricultural machinery parts, railway castings, oilfield components, ect. For larger components, sand casting could be replaced. Typically, a linear tolerance of +/-.005 inches/inch is standard for the Lost Foam process. This tolerance will vary depending on part size, complexity and geometry. Subsequent straightening or coining procedures will often enable even tighter tolerances to be held on critical dimensions. A targeted effort between the foam pattern producer, the casting producer and the casting user will often result in a Lost Foam casting that substantially reduces or completely eliminates previous machining requirements. Because a permeable refractory coating is applied around the smooth foam pattern, the resultant finish is excellent. The lost foam casting process from CFS foundry can reach a smooth surface finish close to Ra6.3. Cost of lost foam castings are generally more expensive than forged parts, or parts made by other casting processes. Generally, 500-1000 pieces per order is the minimum production run to be economical. The value inherent in the Lost Foam process versus other processes is seen in tighter tolerances, weight reduction and as-cast features which all results in less machining and cleanup time. Many castings that require milling, turning, drilling and grinding can be made in the Lost Foam process with only .020” – .030” of machine stock. It is imperative that the features to be cast are discussed by all parties to determine the net finished product cost. Lost Foam castings are used for many critical applications, including engine heads, marine motors, high-pressure pumps and valves. X-ray and soundness testing on Lost Foam castings shows characteristics comparable to other casting processes. As with all processes, lead times of lost foam castings vary greatly depending on part complexity. Generally, 8 to 12 weeks is typical for completed tooling and first castings produced. After casting approval, 10 to 12 weeks is typical for production run startup. Density of Material used for pattern Density of Expanded Polystyrene Patterns – 42 kgs./m³ sufficient for strong, sturdy, dimensionally accurate and light patterns. Density of Microcrystalline Wax Patterns – 795 kgs./m³, resulting in heavy delicate patterns. Maximum Weight of Cast Part No limitation of weight of cast part. Well Below 125 kgs. Methoding Flexible, risers are simply glued on the pattern to suit the methoding. Furthermore the feeding ability of riser is improved with the use of exothermic sleeves. Difficult and has limitations in addition to the problem of riser backfilling. Effect of atmospheric heat on patterns No effect on EPS pattern once cooled in the molding tool. Possibility of Wax pattern to warp or bend. The above information provided is of a general nature of lost foam casting and is intended to provide initial guidelines for process consideration. We still need to evaluate this process with detailed products. 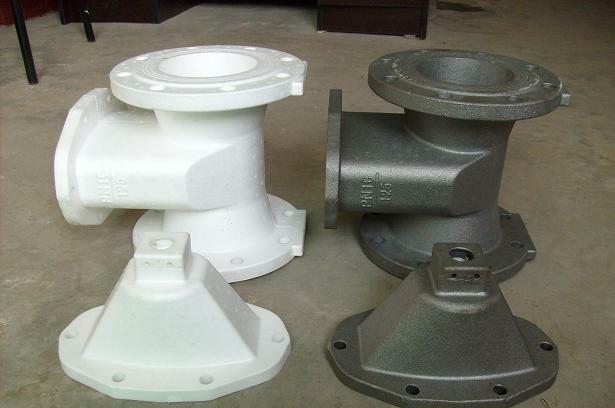 Lost foam casting for Iron castings is a new production method to reduce consumption and more friendly to environment. If you have more specific questions for a project that you are considering, please contact us. We will be happy to discuss your project with you and suggest an ideal casting method from a professional perspective.